Dog collars come in all different shapes and sizes. There are some that are cute and delicate that offer more style than substance. Then there are those that are thick and heavy duty for extra security. The best dog collars for pit bulls definitely need to fall somewhere within this latter range. Pitbulls require a little more from their collars and it pays to take the time to find the best collars for pitbulls for them. In this guide, we will look at 10 different products in a range of styles and designs – all of which are either built specifically for these types of breeds, or have something a little special. After these pitbull dog collar reviews we will look at some of the important considerations for buying the perfect collar for your dog. This includes looking at key features and the fit. Before that, let’s consider exactly why these animals need there own special pitbull collars. Why do pitbulls need a specific type of collar rather than something “ordinary”? Important features to consider when looking for the perfect pitbull dog collar? What have we learned about finding the best dog collar for pitbulls? Some new pitbull owners may wonder why they need to search for something different, and potentially pay out more money. Why can’t they just use a normal collar. The simple answer here is that the normal collar isn’t going to last long enough or take the punishment dished out by these dogs. Some will wear out too quickly, meaning that cheaper options are actually more of a waste of money than more expensive, substantial ones. You may also not get the fit of comfort needed. To begin with, we have to remember that pitbulls are strong, muscular dogs. Many owners of rescue pups would much rather see these animals as goofy bundles of fun. But, there is a lit of muscle mass behind those cuddles. This means that any pitbull that pulls at a leash is more likely to snap their collar if it isn’t secure enough. There is also the fact that pitbulls are powerful chewers. If they are left alone with an unfastened collar they may see it as a challenging chew toy and destroy it. Below we have a list of 10 different top rated pitbull collars. They come in different materials and styles to help you determine the best option for your dog. We have collected some of the key points here for easy reading. The first set of three collars in this guide are all made from leather. This means strength, quality and nice look. There are different approaches to the aesthetics and the features. This model comes in the choice of either black of mahogany and is a thick collar with a two pronged buckle for extra security. The first benefit here is the amount of size options that are available. There are different circumferences for different neck sizes. But, there are also different widths to the collars. There is the option for free personalisation on this collar with up to 12 characters in the smallest font. There is also great attention to detail with the stitching and use of heavy duty nickel plated rings and buckles. There are some that point out that the thick leather is quite stiff at first. No returns policy on customised items – so make sure to get the right fit. This next option is a thick collar with small metal studs in brown, red or white. It comes in three sizes with the largest measuring in at 22.6-25.6 inches. This is sold as a more high-end option with the 100% genuine leather, soft padding good stitching. It is an attractive looking product that should receive plenty of compliments. One of the main benefits here is the quality that comes from the choice of materials. There is attention to detail not seen in some other models. This quality also adds to the strength of the collar, which is essential with this breed. Then there is the look of the collar. This is a handsome option where others can looker cheaper or more extreme. Unfortunately, there are some cases of dogs scratching the leather and ruining the look of the product. There is also the issue of the higher cost compared to some other models, especially the nylon ones. This one is a bit hit or miss when it comes to the look. The spikes aren’t going to be to everyone’s taste at all. This is potentially threatening looking to other dog owners. Still, there is a definite market for this style when we consider the number of studded collars and harnesses for these types of dogs. This collar is made from a thick leather in a range of sizes and colours. Therefore, you can have a soft pink or white to offset the studs. There are four sizes in this range from extra smaller to large. While the XS is probably too small for most pit bulls, it may suit some younger dogs. The larger ones should be fine. This thick leather should be fairly durable. This is great for well behaved dogs that are good on the lead and there is a nice attachment at the back. This isn’t great for those that pull because it isn’t always strong enough. There is also a lack of features, such as minimal room for tags and ID. Moving onto some nylon options now, we have another group of collars that are built to last. Leather is nice, but there are other options if brands use the right materials and quality control. This option is a good looking, thick collar with a heavy duty nylon. It is specifically designed for pitbulls and also has a cute little Bully’s tag on it. The first benefit is one shared by many of the best nylon pitbull collars. There is a 2 pronged buckle for added security while on the leash. There is the choice of deep black with a colourful trim or a bright orange or red, so this can really stand out on the dog. It appears to be tough enough to handle must pitbulls. These collars need strong metal rings to hold the heavy strap in place, but here they are prone to breaking. Once again, there are some sizing issues. The term military can either be attractive or off-putting depending on the owner. Those that like this style will also be hopeful for a tough product. Here there is a strong nylon in a military style ranger green. This is another option with the double pronged buckle for security and thickness. The first benefit here is the amount of cushioning in the padding of this collar. This means that there should be no worries about discomfort or chaffing. There are also great reports about the strength of this collar while out walking. There is also room for ID tags for increased personalisation. 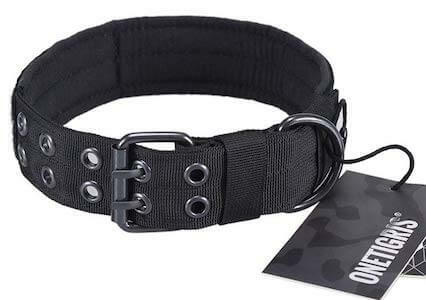 Although this is an adjustable collar, it only comes in medium or large sizes of 14.6-17.7 inches or 17.7 to 20.9 inches. This isn’t as big a range as other collars, and there is no overlap. Some owners note that there is also the potential for chewing if the dog is left unattended with the collar off. The last of these nylon options is another with links to military use and tactical operations. The reason for this is that these tougher vests are so helpful when dealing with active, strong animals. This is another option with an adjustable double pronged buckle. It comes in different colours to suit different tastes and there is even a magic sticker id panel, which is a bit different. The sizes come in medium at 14.5-18.5 inches, large at 17.5-21.5 inches and extra large at 21-25.5 inches. This means there is a nice range and overlap on the sizes. There are also dog owners that claim that this is strong and durable. There is a lot of material here in this sturdy vest. This means that some suggest that it is perhaps too thick for some dogs. There are some occasional reports of rust on the metal buckles and other elements, which suggests a lack of quality control in this one area. For our next trio of collars we come to the chain collars. These options aren’t popular with all dog owners because of the connotations and lack of features. Yet, others prefer them because of their look and strength. This option is a Cuban style thick metal chain, it is 20mm wide and comes in different lengths from 16 to 38 inches. This is undoubtedly a tough collar. It is built to hold up to 680lbs and should be strong enough for the most tenacious pitbulls. Then there is the quality of the material. This is made from a strong stainless steel that won’t cause irritation or damage to the dog’s skin. Comes in a velvet lined gift box so is also a great gift for other pitbull owners. Despite its thickness, this model is heavier than some users has expected. This means that it may take some getting used to from the dog’s perspective. Some would also like to see more safety features to stop the chain from tightening too much. This option is a little less imposing than some other pitbull heavy chain collars because the links aren’t are thick. This thinner chain also comes in black rather than the shiny chrome-looks. This 15mm option should, therefore, be lighter. This is still stainless steel, so should have the same rust proofing and strength. This chain comes in a series of lengths with suggests dog neck sizes. The shortest is 12 inches long and the longest 34 inches. This means a good range for different dogs. A more subtle look than some of the more imposing chains around. A smooth link for easy motion as users restrain and control the dog. The rings on the end are plastic, not metal, so aren’t as strong and durable. There are comments about the black coating chipping off. In many ways, this option brings together the best features of the products above. There is a thin chain of smaller links that slip through big metal rings. The stainless steel has a metallic shine, but not the overt “bling” of other, thicker collars. It comes in plenty of lengths from 16 inches to 26 inches. The use of metal rings, not plastic, should mean more strength and longevity. A small minority feel that the motion of the links through the rings isnt as smooth as they would like. There isn’t any room for personalisation, tags or any extras. It really is just a chain. Finally, we have this option that uses two different materials on different parts of the collar. There is a strong 100% iron chain at the back of the neck to link up to the leash, then there is the fabric for the front of the neck for comfort. The idea here is that this should provide the best of both worlds for dog owners. The biggest pro here is the safety feature, something missing on some of the products above. The collar only tightens enough for subtle control over the dog. There is a stop in place to prevent damage. Some dog owners also like the durability on both elements of the collar, with the strong links on the metal and the stitching on the nylon. There are plenty of report from users that say that this works well as a training collar. There are some reports of the dye coming off on some products. This is especially noticeable on dogs with pale fur. There are also some of the usual sizing issues that we see with this sort of product. Material: The first thing to think about here is clearly the material used. Nylon has its potential when it is thick enough and the collar is well made. Leather collars are thick, strong and possibly a little more rigid. There is a nice look to some of these, but not the patterns of some military-style collars. The alternative is the chain. It is understandable f some dog owners would prefer not to use the chain because of the training methods and fit. But, this can be a strong, reliable option in the right hands. Strength: On the subject of strength, you also need to consider the durability of the item. The material is a good starting point here. But, you also need to think about the way that the collar is put together. Double stitching is always more reliable than single stitching. Any D rings, eyelets and bands need to be secure and strong. The best way to get a better idea of this before you buy is to read user reviews. They can give a more objective viewpoint on the quality of the item and its longevity. Size: The fit of the collar is also important. There are two aspects to consider here. The first is the way that it fits around the dog’s neck. An adjustable collar with enough eyelets is a good start. This means that even if you measure the dog’s neck precisely, there is a little room for error or for sizing discrepancies. Also look for brands that have different collars in varying sizes. Your pitbull may be a little smaller than average and may not fit the “medium” standard of the brand. Personalised collars are a popular idea with many dog owners. Dog tags are a good starting point for basic contact information and some of the best pitbull collars will have rings for these tags . But, there are other options. There are some companies that will engrave information onto leather collars for a clear inscription and nice look. This is ideal for these wide leather pitbull collars. The alternative is to get a plate and attach it to the collar. Either way, these inscriptions can prove to be highly beneficial if a dog runs off. There are lots of different companies out there trying to provide a collar that is suitable for this breed. They understand that owners need something with a little more security and strength. The best models often have thicker leather or double stitched nylon with a double pronged buckle. The strength and purpose are the main selling points, but that doesn’t mean that you can’t find a collar with some style – even if it is a chain. Whichever collar you choose, make sure that it is the right size and comfortable for the dog. If you go for something too loose they may slip out of it when pulling on the leash. Too tight and it may constrict the throat or cause injury. Compare your options carefully to find the style that best collars for pitbulls that suit your dog.